MMS OCTOBER 2018 90 mmsonline.com CREEP-FEED GRINDING change to the sequence of the process. In that traditional role of grinding as a finishing opera- tion, the part often undergoes heat treatment just ahead of this step. Grinding is an eective process for machining in the harder, post-heat-treatment state, though milling the part in this state would be problematic. Thus, most of the part's machining is carried out through milling while the workpiece is still soft, then comes heat treating, then the part may receive a final light milling step before grinding or it may go to grinding directly. This sequence—milling, sending the part away for heat treatment, bringing the part back to the shop for the operations including grinding—is second nature to manufacturers and a standard way many parts are made. However, creep-feed grinding can undo that sequence. The workpiece could be heat treated first, meaning the workpiece could be brought to its final hardness first, before any machining is done. Creep-feed grinding would eliminate the interrup- tion, delay and coordination necessary to ship a partially completed part away for this o-site step. 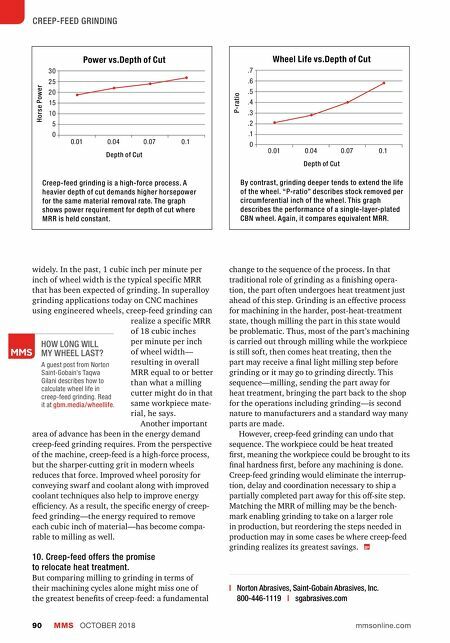 Matching the MRR of milling may be the bench- mark enabling grinding to take on a larger role in production, but reordering the steps needed in production may in some cases be where creep-feed grinding realizes its greatest savings. widely. In the past, 1 cubic inch per minute per inch of wheel width is the typical specific MRR that has been expected of grinding. In superalloy grinding applications today on CNC machines using engineered wheels, creep-feed grinding can realize a specific MRR of 18 cubic inches per minute per inch of wheel width— resulting in overall MRR equal to or better than what a milling cutter might do in that same workpiece mate- rial, he says. 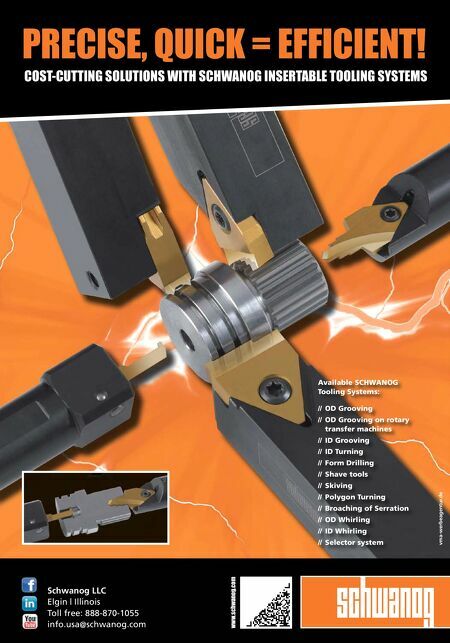 Another important area of advance has been in the energy demand creep-feed grinding requires. From the perspective of the machine, creep-feed is a high-force process, but the sharper-cutting grit in modern wheels reduces that force. Improved wheel porosity for conveying swarf and coolant along with improved coolant techniques also help to improve energy eˆciency. As a result, the specific energy of creep- feed grinding—the energy required to remove each cubic inch of material—has become compa- rable to milling as well. 10. Creep-feed offers the promise to relocate heat treatment. But comparing milling to grinding in terms of their machining cycles alone might miss one of the greatest benefits of creep-feed: a fundamental | Norton Abrasives, Saint-Gobain Abrasives, Inc. 800-446-1119 | sgabrasives.com 30 25 20 15 10 5 0 0.01 0.04 0.07 0.1 Depth of Cut Power vs.Depth of Cut Horse Power Creep-feed grinding is a high-force process. A heavier depth of cut demands higher horsepower for the same material removal rate. The graph shows power requirement for depth of cut where MRR is held constant. .7 .6 .5 .4 .3 .2 .1 0 0.01 0.04 0.07 0.1 Depth of Cut Wheel Life vs.Depth of Cut P-ratio By contrast, grinding deeper tends to extend the life of the wheel. "P-ratio" describes stock removed per circumferential inch of the wheel. This graph describes the performance of a single-layer-plated CBN wheel. Again, it compares equivalent MRR. A guest post from Norton Saint-Gobain's Taqwa Gilani describes how to calculate wheel life in creep-feed grinding. Read it at gbm.media/wheellife. HOW LONG WILL MY WHEEL LAST?